Tis the season to be jolly and sparkly, and this J.Crew Glitter iPhone Case ($25) will definitely get you in the mood for the holidays if you aren't already. 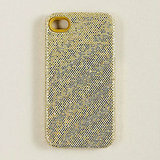 Fitting your iPhone 4/4S, this polycarbonate case is covered with glitter-encrusted cotton fabric, which will help keep your phone scratch free. Coming in silver and gold, this case makes for the perfect accessory to your upcoming seasonal fetes.